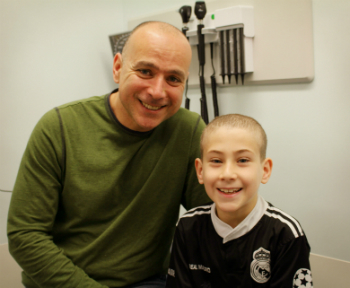 Amine is a bright, energetic nine-year-old with an endearing smile. His mother Helen says he has a great character and anyone who meets him can see it within seconds. Amine was born with spina bifida, a condition that affects the development of the spine before a baby is born. While some children with spina bifida are unable to walk and need a wheelchair to get around, Amine is considered high functioning since he’s able to walk and do many other things. Amine sees the team members from the hospital’s spina bifida program on a regular basis. The multidisciplinary team includes specialists from neurosurgery, urology and general pediatrics, as well as a nurse clinician and physiotherapist. When Helen was pregnant with Amine, a routine ultrasound at 19 weeks revealed something she and her husband Toufik weren’t expecting. “The results showed there was a lemon sign in the baby’s brain, which is usually an indication of hydrocephalus. His spinal cord was also outside his body,” she says. Spina bifida is a condition that occurs in the first month of pregnancy around day 21, when the fetus’s neural tube develops. As the fetus grows, the arches of the vertebra that normally protect the spinal cord do not form properly so the spinal cord and its coverings are not protected. A sac forms and bulges out of the spine. The severity of the newborn’s spina bifida depends on where the spinal cord is exposed. Usually, the higher up the spinal cord it is found, the more serious the condition will be. In more severe cases, a child will not be able to walk or will need braces in order to move around. Hydrocephalus, a condition in which cerebrospinal fluid accumulates in the brain, is another problem associated with spina bifida. It occurs when the fluid that goes from the brain around the spinal cord does not circulate properly. Neurosurgeons treat hydrocephalus by putting a shunt in the brain to help drain and redirect fluid to the abdomen. Immediately after Amine was born, he was transferred to the Montreal Children’s Hospital neonatal intensive care unit (NICU). Part of his spine was protruding from his back and within two days, Dr. Jeffrey Atkinson, a neurosurgeon at the Children’s, performed surgery to correct the problem and close up his back. Less than two weeks later, Amine had another surgery: Dr. Atkinson inserted a ventricle peritoneal (VP) shunt to treat his hydrocephalus. The shunt has worked well for Amine. “We’re pretty fortunate that he’s never needed the shunt repaired or replaced,” says Helen. “The shunt has three distinct parts, and there’s enough drainage tubing to grow with him into adulthood.” Although Amine is high functioning, he is showing signs of some learning difficulties, which is sometimes the case for children with hydrocephalus. Children with spina bifida can also have bladder and bowel problems. In consultation with Dr. Mohammed El Sherbiny, Amine’s urologist, Helen and Toufik are currently learning about the Chait trapdoor procedure, which would help minimize Amine’s bowel problems.